Saint Andrew, whose feast day is November 30th, is the patron saint for fishermen. Andrew, like his brother, Simon Peter, was a fisherman. He became a disciple of the great St. John the Baptist, but when John pointed to Jesus and said, “Behold the Lamb of God!” Andrew understood that Jesus was greater. At once he left John to follow the Divine Master. Jesus knew that Andrew was walking behind him, and turning back, he asked, “What do you seek?” When Andrew answered that he would like to know where Jesus lived, Our Lord replied, “Come and see.” Andrew had been only a little time with Jesus when he realized that this was truly the Messiah. From then on, he decided to follow Jesus. Andrew was thus the first disciple of Christ. Next, Andrew brought his brother Simon (St. Peter) to Jesus and Jesus received him, too, as His disciple, At first the two brothers continued to carry on their fishing trade and family affairs, but later, the Lord called them to stay with Him all the time. He promised to make them fishers of men, and this time, they left their nets for good. It was at this time also that James and John were called, and Andrew appears with them and his brother at the head of the list of the twelve apostles. It was he who brought to our Lord the boy with the five barley loaves and two fishes at the feeding of the five thousand; and he and Philip told our Lord of the gentiles who had come asking if they might see him (John 12:20-22). 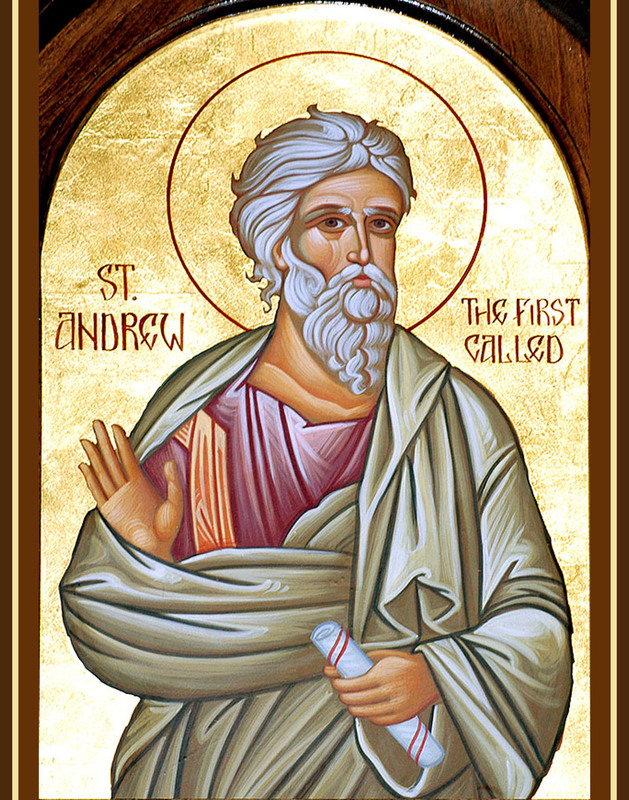 It is believed that after Our Lord ascended into Heaven, St, Andrew went to Greece to preach the gospel. We have various accounts of the later life of St Andrew, but they are fragmentary and mainly not dependable. The Christian historian Eusebius tells us that he preached in Scythia. St Gregory Nazianzen says that he went to Epirus, St Jerome that he was in Achaia–and there seems a genuine tradition that he was indeed in Greece. The medieval tradition that he finally arrived at Constantinople and founded. a church there is apparently unfounded; and the details of his martyrdom are equally uncertain. He is said to have incurred the enmity of the proconsul at Patras in Achaia, and to have been bound to a cross, where he remained two or three days preaching to the people who came to watch him, before he died. Andrew is the patron of both Russia and Scotland. His connection with Russia is based on a tradition that in his missionary journeyings he preached in that country, reaching the city of Kiev in what is now the Ukraine, which was the center of the conversion of Russia in the eleventh century. Legend connects him with Scotland. It says that in the fourth century the guardian of the relics of Andrew at Patras was told in a dream to take part of them to a place that would be shown to him. He was led to what is now St Andrews in Scotland; he built there a church and preached to the heathen people. The St Andrew’s cross-‘aspire’ or X-shaped-of Scottish heraldry, often supposed to have been the form of cross on which Andrew was martyred, does not, in fact, seem to have been associated with the saint before the fourteenth century. He is said to have been put to death on the X cross, to which he was tied, not nailed. He lived two days in that state of suffering, still preaching to the people who gathered around their beloved Apostle. Two countries have chosen St. Andrew as their patron – Russia and Scotland. Lesson from the Epistle of blessed Paul the Apostle to the Ephesians. Brethren, to every one of us is given grace according to the measure of the giving of Christ. Wherefore He saith, Ascending on high, He led captivity captive; He gave gifts to men. Now, that He ascended, what is it, but because He also descended first into the lower parts of the earth? He that descended is the same also that ascended above all the heavens, that He might fill all things. And He gave some apostles, and some prophets, and other some evangelists, and other some pastors and doctors, for the perfecting of the saints, for the work of the ministry, for the edifying of the body of Christ; until we all meet into the unity of faith, and of the knowledge of the Son of God, unto a perfect man, unto the measure of the age of the fulness of Christ. Thou shalt make them princes over all the earth: they shall be mindful of Thy name, O Lord. V. Instead of Thy fathers sons are born to Thee: therefore shall people praise Thee. Alleluia, alleluia. V. Thee, the glorious choir of the apostles doth praise, O Lord. Alleluia. At that time, Jesus, walking by the sea of Gaiilee, saw two brethren, Simon, who is called Peter, and Andrew his brother, casting a net into the sea (for they were fishers). And He saith to them, “Come ye after Me, and I will make you to be fishers of men:” and they immediately leaving their nets followed Him. And going on from thence, He saw other two brethren, James the son of Zebedee, and John his brother, in a ship with Zebedee their father mending their nets; and he called them: Peter answered, Thou art Christ, the Son of the living God, and they forthwith left their nets and father, and followed Him. To me Thy friends, O God, are made exceedingly, honorable: their principality is exceedingly strengthened. You who have followed Me shall sit on seats judging the twelve tribes of Israel.